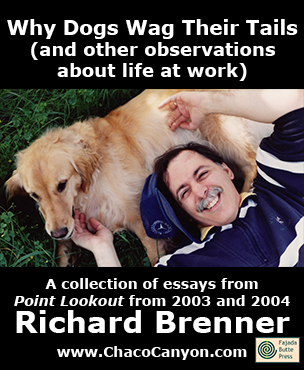 Why Dogs Wag Their Tails (and other observations about life at work) is a collection of past issues of Point Lookout, my weekly email newsletter of tips, insights and perspectives that help people in dynamic problem-solving organizations find better ways to work with each other. The articles are from 2003 and 2004. The book gives concrete, nuts-and-bolts methods for dealing with real-life situations. Why Dogs Wag is a collection of short articles that give tips, insights and new perspectives on life in the modern workplace. 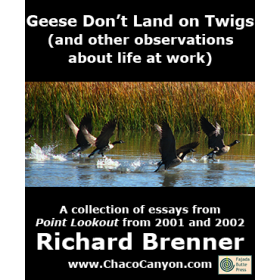 It's drawn from the 2003 and 2004 issues of my newsletter, Point Lookout , and it's filled with the insights you need to make sense of it all. It helps you avoid the traps and pitfalls that await you at work, and it guides you into new choices that can make life at work more enjoyable and rewarding. Why Dogs Wag makes a wonderful and unique gift for a friend, a colleague, or a spouse who faces any of the ordinary — and many of the not-so-ordinary — challenges of working today. This book is about changing your experience of work. By broadening the choices you have when you respond to what happens around you — and within you — you can make your job a source of your happiness, rather than a threat to it. A toxic project is one that harms its organization, its people or its customers. We often think of toxic projects as projects that fail, but even a "successful" project can hurt people or damage the organization — sometimes irreparably. We spend a lot of time and emotional energy in meetings, much of it engaged in any of dozens of ritualized games. Here's a little catalog of some of our favorites, and what we can do about them. As a way of managing risk, we sometimes steer our organizations towards commercial off-the-shelf (COTS) components, methodologies, designs, and processes. But to gain a competitive edge, we need creative differentiation. When we notice patterns or coincidences, we draw conclusions about things we can't or didn't directly observe. Sometimes the conclusions are right, and sometimes not. When they're not, organizations, careers, and people can suffer. To be right more often, we must master critical thinking. When we receive messages of disapproval, we sometimes feel bad. And when we do, it can help to remember that we have the freedom to decide whether or not to accept the messages we receive. When projects near completion, we sometimes have difficulty letting go. We want what we've made to be perfect, sometimes beyond the real needs of customers. Comfort with imperfection can help us meet budget and schedule targets. When projects run over budget, managers face a temptation to use creative accounting to address the problem. The budget swap is one technique for making ends meet. It distorts organizational data, and it's just plain unethical. In tough negotiations, when attempts to resolve differences have failed, we sometimes conclude that "they've made up their minds," but other explanations abound. Keeping an open mind about why other people seem to have closed theirs can help us find a resolution. Whether we belong to a small project team or to an executive team, we have limited resources and seemingly unlimited problems to deal with. How do we decide which problems are important? How do we decide where to focus our attention first? When organizations go astray ethically, and their misdeeds come to light, people feel shocked, as if they've been swept up by a tornado. But ethical storms do have warning signs. Can you recognize them? 30	Finger Puzzles and "Common Sense"
Working on complex projects, we often face a choice between "just do it" and "wait, let's think this through first." Choosing to just do it can seem to be the shortest path to the goal, but it rarely is. It's an example of a Finger Puzzle. When a cell phone goes off in a movie theater, some of us get irritated or even angry. Why has the cell phone become so prominent in public? And why do we have such strong reactions to its use? You may have heard the phrase "plenty of blame to go around," or maybe you've even used it yourself. Although using it sometimes does bring an end to immediate finger pointing, using it also validates blame as a general approach. Here's how to end the blaming by looking ahead. When you give a demo to a small audience, there's a danger of overwhelming them in a behavior I call swarming. Here are some tips for terrific demos to small audiences. The false opportunity appears to be a chance to perform, to contribute, or to make a real difference. It's often something else. The Three-Legged Race is a tactic that some managers use to avoid giving one person new authority. Some of the more cynical among us use it to sabotage projects or even careers. How can you survive a three-legged race? When we offer a contribution to a discussion, and everyone ignores it and moves on, we sometimes feel that our contribution has "plopped." We feel devalued. Rarely is this interpretation correct. What is going on? What happens when you learn that your new boss is younger than you are? Or when the first two applicants you interview for a position reporting to you are ten years older than you are? Do you have a noticeable reaction to org chart age inversions? If you've ever known a particular dog at all well, you've probably been amazed at how easy it is to guess a dog's mood, even though dogs can't speak. Perhaps what's more amazing is that it's so difficult to guess a person's mood, even though humans can speak. Nearly everyone I know complains that email is a time waster. Yet much of the problem results from our own actions. If you're looking around for some New Year's resolutions to make, here are some ideas. How we cope with problems is a choice. When we choose our coping style, we help determine our ability to address the problems we face. Of eight styles we can identify, only one is universally constructive, and we rarely use it. In project work, we often make decisions with incomplete information. Sometimes we narrow the options to a few, examine their strengths and risks, and make a choice. In our deliberations, some advocates use a technique called the Straw Man fallacy. It threatens the soundness of the decision, and its use is very common. When we depend on praise, positive support, or consumption to feel good, we're giving other people or things power over us. Finding within ourselves whatever we need to feel good about ourselves is one path to autonomy and freedom. Politicians know that answering hypothetical questions is dangerous, but it's equally dangerous for managers and project managers to answer them in the project context. What's the problem? Why should you be careful of the "What If?" 63	Who Would You Take With You to Mars? When we bring national or local political issues into the workplace — especially the divisive issues — we risk disrupting our relationships, our projects, and the company itself. Whether you're a CEO appealing to your Board of Directors, your stockholders or regulators, or a project champion appealing to a senior manager, you have to "sell uphill" from time to time. Persuading decision-makers who have some kind of power over us is a challenging task. How can we prepare the way for success now and in the future? When we use threats and intimidation to win debates or agreement, we lay a flimsy foundation for future action. Using fear may win the point, but little more. Here's a little catalog of films and videos about project teams that weren't necessarily meant to be about project teams. Most are available to borrow from the public library, and all are great fun. However ethical you might be, you can't control the ethics of others. Can you tell when someone knowingly tries to mislead you? Here's a catalog of techniques misleaders use. Cutouts are people or procedures that enables political operators to communicate in safety. Using cutouts, operators can manipulate their environments while limiting their personal risk. How can you detect cutouts? And what can you do about them? Do you have some little secret tricks you use that make you and your team more effective? Do you wish you could know what secret tricks others have? Here's a way to share your secrets without risk. One often-neglected project risk is the risk of inaccurately reported status. That shouldn't be surprising, because we often fail to report the status of the project's risks, as well. What can we do to better manage status risk and risk status? Most of us have participated in group decision-making. The process can be frustrating and painful, but it can also be thrilling. What processes do groups use to make decisions? How do we choose the right process for the job? 93	Are You Micromanaging Yourself? Feeling distrusted and undervalued, we often attribute the problem to the behavior of others — to the micromanager who might be mistreating us. We tend not to examine our own contributions to the difficulty. Are you micromanaging yourself? When we take time to express to others our appreciation for what they do for us, a magical thing happens. Why Dogs Wag is in Acrobat format, which gives you several advantages. You can print it, and read it like any book. Or in electronic form, you can use the search capability of Adobe Reader to find passages of special interest to you. If you load it onto your laptop, tablet, or other mobile device, you can read it anywhere — and it's weightless, too. 236 pages.